It’s been a relatively quiet winter regarding NorthPoint news, but just as the weather is warming up, so are NorthPoint dealings and other related news. As always, please stay tuned for our Facebook page for more timely updates. The Village of Elwood informed the public in early March that NorthPoint had approached them in February, alleging that the Village was required to cooperate with them build a bridge at Walter Strawn Drive over the Walter Strawn Drive railroad crossing, which was closed permanently by the ICC in 2017. This assertion was based on the previous annexation agreement that was made between the Village of Elwood and Centerpoint, which previously owned the property that LB Anderson Land Holdings, Inc.(aka NorthPoint) now owns. In a preemptive move, the Village of Elwood filed suit with LB Anderson for a declaratory judgement from the court to determine what obligations they have to the current landowners. The suit is currently scheduled for a status hearing June 19, 2019; however, that date may be updated. The Herald News, WJOL and Farmer’s Weekly reported on the update. 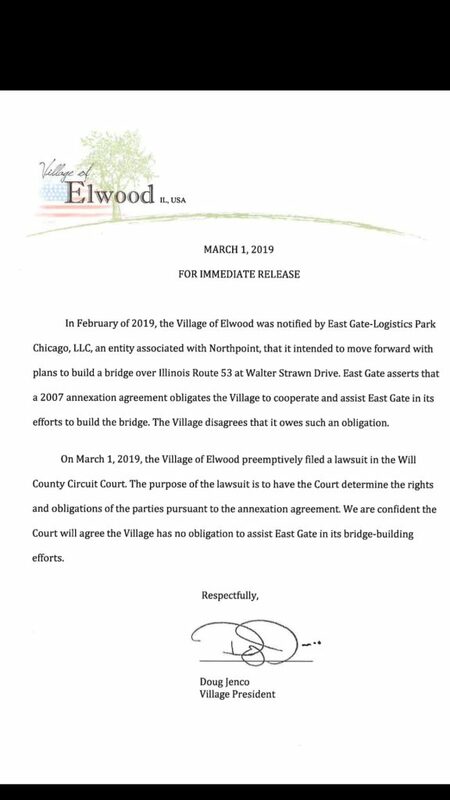 We FOIA’d a copy of that agreement, and we are confident that the Village of Elwood will prevail and that Elwood will not be obligated to assist NorthPoint aka East Gate aka LB Anderson Land Holdings with any bridge building. Meanwhile, we have stayed up-to-date and no property transactions have been made public with regard to property in the path of the proposed Compass Business Park. Additionally, the application that NorthPoint previously filed with Will County appears to be stalled with no activity reported. Amid reports that the Houbolt Bridge lawsuit had settled, court documents show that the matter is still alive in the court system as of today’s post. The matter has been scheduled for status hearings multiple times, with the most recent status hearing scheduled for 9am on March 25, 2019. Though representatives from each entity may be getting close to a settlement, as has been reported for months, a settlement has not yet been made public. The public access site for the courts was not updated as of Monday afternoon. This is an important agreement that must be paid attention as it may potentially impact truck routes east of Route 53, which could limit NorthPoint’s ability to create truck routes should they proceed with the original plans for Compass Business Park. Early voting is now underway in the local municipal elections. We encourage you to reach out to those campaigning to get their position on NorthPoint and other warehousing projects in the area. In the Village of Manhattan, candidates include incumbents Erin McDonough, James Reeves and Mike Naughton. Challengers include Howard Young and Bob Dilling. In the Village of Elwood, incumbents Mayor Doug Jenco and trustees Daryl Lab, Mary Lopez, and Spike Berscheid are running for reelection. Newcomers Mike Varman, Jodi Bertucci, and Tricia Maas have all campaigned together along with incumbent Spike Berscheid on the same platform. Other Elwood candidates include Ronald Schmidt and Steven Ayres. In the Joliet elections, calls for a moratorium have been made by candidates Damon Zdunich, Terry Morris, and Bettye Gavin. In the Village of Braidwood, mayoral candidate Rich Girot has taken a vocal public stance against NorthPoint. The dilapidated state of the Des Plaines River bridge on I-80 has drawn attention and ire from local officials, citing that the bridge is “safe” despite the dangerously low structural rating and news attention. With a multitude of bridges in the Joliet area that have structurally unsound ratings according to IDOT reports, there is simply not enough funds to fix them. While some repairs will be made to the Des Plaines bridge, it is in need of complete replacement, according to reports. Illinois Representative Larry Walsh Junior introduced a bill that would turn over I-80 to the Illinois Toll Authority. WJOL broke the news this morning. Additionally, Representative Anthony DeLuca, who happens to represent nearby Manhattan, introduced a resolution on the House floor – which subsequently passed – proclaiming support for both the Illiana and the Peotone Airport, both of which have vehemently opposed by residents in the path of both proposed projects. You can read the resolution in full text on the IGA website. Feel free to contact Representative DeLuca and let him know how you feel about his decision to push for both projects. Stay tuned to our Facebook page for more timely updates. We will post here as time allows! Thank you for following our website and for your support.